It’s a bird, it’s a plane, it’s Lois Lane! 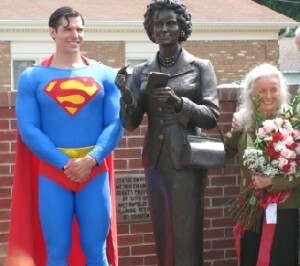 The Noel Neill (Lois Lane) statue was officially unveiled on June 11, 2010 (source: Fox2Now). Superman’s gal-pal Lois Lane finally got her due in Metropolis, when the Illinois city erected a statue to honor Lois, a.k.a. actress Noel Neill. 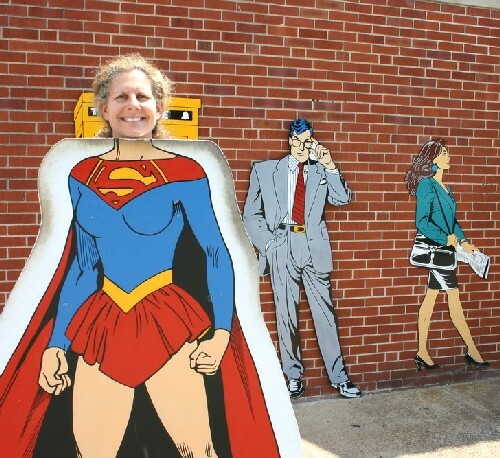 Being a reporter myself, I couldn’t help but wonder where Lois was when we stopped by Metropolis in 2007. As much as I missed her, I did get a little sidetracked posing in goofy super-cutouts. Wessel, too, kept mugging for the camera. Who can resist? 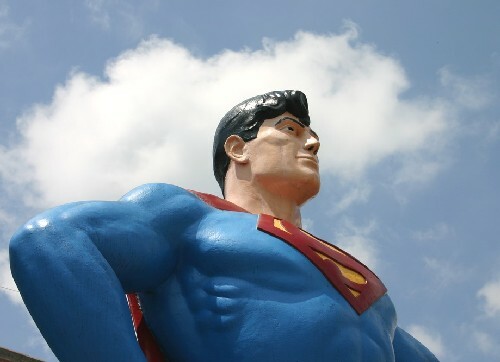 We were in awe of the giant 15-foot Superman statue, which you’ll find by following the signs to the “Giant Superman Statue” in Superman Square next to the Super Museum and souvenir shop. 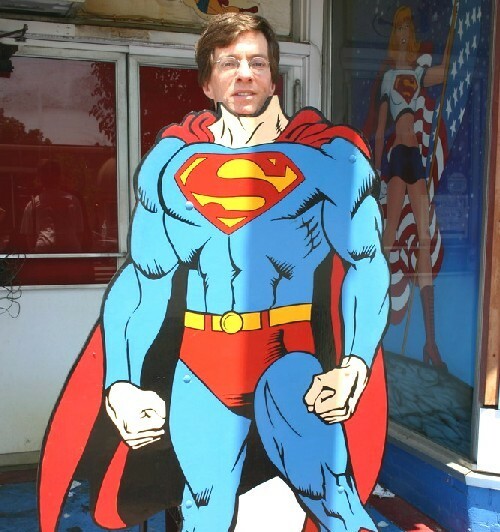 The city of 6,500 on the banks of the Ohio River grows by leaps and bounds every June, when some 30,000 Superman nuts, I mean fans, fly in to celebrate the Man of Steel. Superlatives abound and costumes are donned. I’m sorry we missed it. Sort of. One attendee for years has been Noel Neill herself, and this year she was the star attraction. I’m impressed that at 88 she would even attend such a madcap event. She was there for the unveiling of the statue, on June 11. More than 300 bricks surround it, engraved with donors’ names. Next up for Noel is fans are trying to pull a Betty White by using a Facebook page to beg the producers of “Smallville” to put Noel/Lois on a segment next year, its 10th and final season. It’s about time, I say! In other unrelated news, Wessel and I will need Superman-size strength next week when we cycle some 200 miles of the C&O Canal rail trail. Yes, it’s flat, but consider that we will be carrying our own gear, and, much worse, we are sooooo out of shape because every time we planned to do a training ride it would either rain or the temps would soar to 100. So, keep us in your thoughts and keep the kryptonite away! 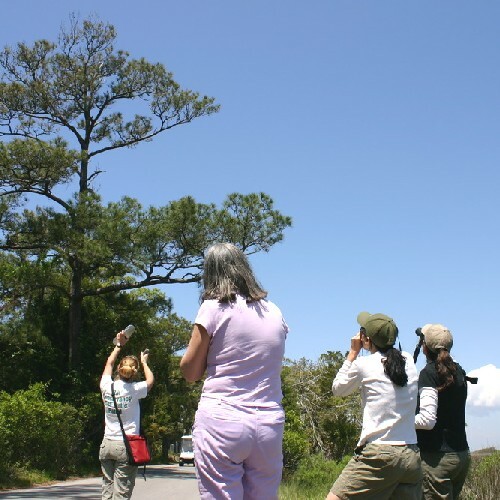 During a recent visit to Oak Island, NC, we could see Old Baldy, the lighthouse on Bald Head Island, in a distance. 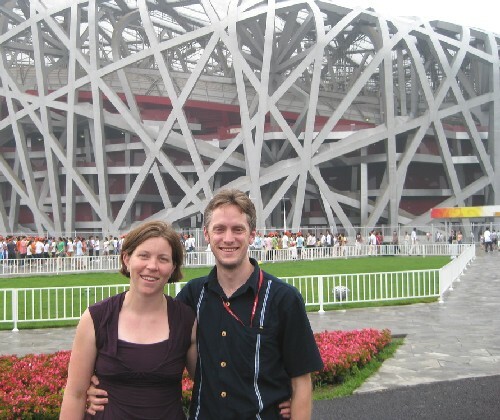 We have fond memories of our 2008 visit to the island. Read on for the story published August 24, 2008, in the Boston Globe. 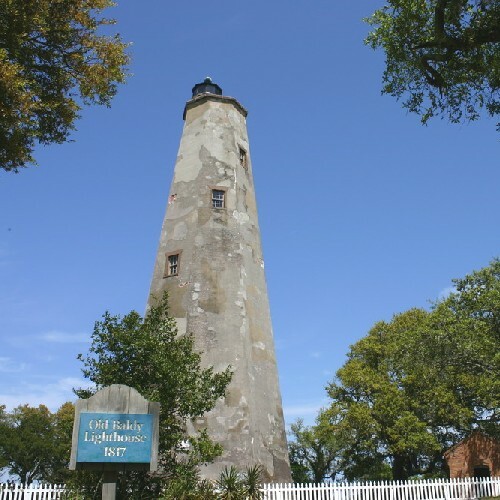 Old Baldy, or the Bald Head Island Lighthouse is the oldest lighthouse in N.C.
BALD HEAD ISLAND, N.C. – Golf carts glided by as our small group stood by the road listening to Maureen Dewire, our guide, play one of her favorite songs: the high-pitched call of the painted bunting. She aimed her iPod with attached speaker toward where she thought one of the brightly colored birds was perched. “Let’s see if we can get his attention,” she said. The bird answered back, and she spotted him high up on a newly leafing limb. “They’re here all summer, but you don’t see them because the males stop singing by late July,” Dewire, 30, said of the painted buntings, which winter in South Florida, Cuba, and the Bahamas. The painted bunting’s rainbow of colors – red chest, blue head, green back – make it arguably North America’s most spectacular songbird. That’s according to the National Audubon Society. 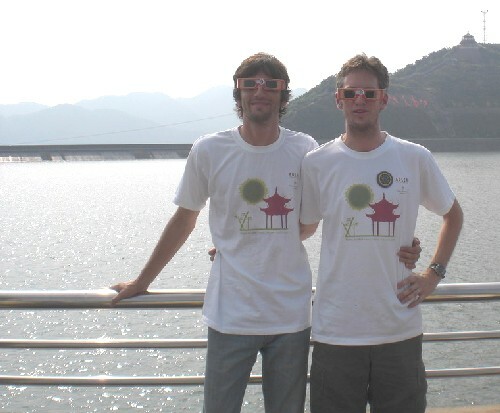 Myself, I had never heard of them until the day before, when I arrived. Bald Head Island’s maritime forest preserve has one of the country’s largest populations of breeding buntings, so I decided I had to see one. But that’s only part of the story. 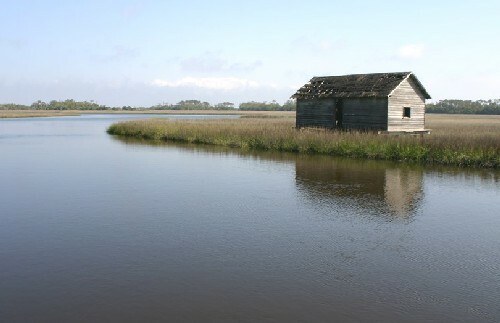 I discovered on a springtime visit that 10,000 of the island’s 12,000 acres have been set aside for conservation. And what is being preserved is worth checking out. 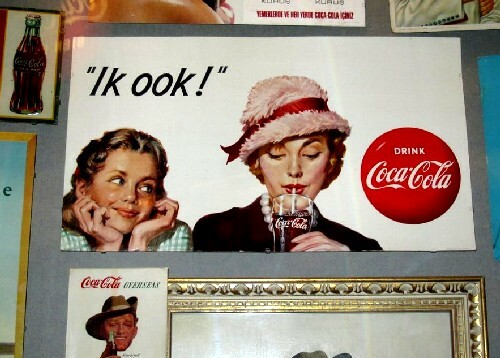 Vintage Coke advertisement, in Dutch! How do you like your Coca-Cola?!? And so begin the liveliest tour introduction I’ve experienced, thanks to a very chipper young woman and no doubt a very savvy marketing team. 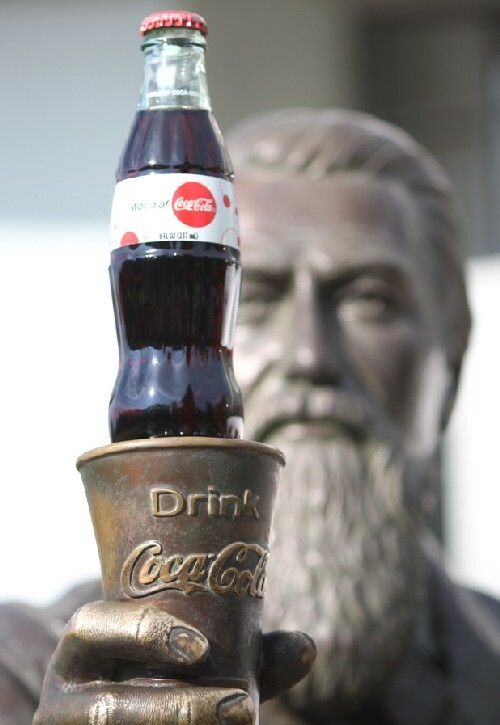 The call-and-response chant (“on the beach!” “in a tall glass of ice!”) kept the crowd fired up until we were released from the holding pen and let loose into the World of Coca-Cola, a totally commercial attraction in downtown Atlanta worth its hefty $15 admission fee. 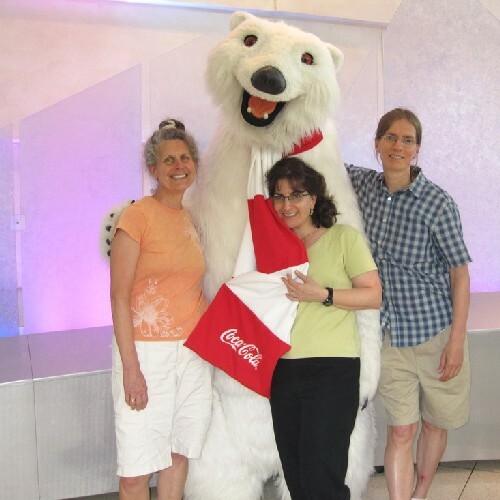 First were the photo ops with impressively towering Coca-Cola Polar Bear, introduced in a commercial in 1993 and going strong. Unlike at some corporate attractions (like the CNN Studio Tour), here you get to take your own photo instead of being forced to use their photographer who then sells the prints for $20. For nostalgia fans, Coke posters, ads, memorabilia and more from around the world are plastered across much available wall space, some more than a century old. Also lining the walls were crazily decorated oversized bottles from around the world. At some point we were funneled into “Inside the Happiness Factory: A Documentary,” an animated mockumentary featuring the characters of the Happiness Factory, which I later learned was linked to an advertising campaign. Because I’d missed the campaign, I didn’t get the bizarre little film at all. More enjoyable in a completely cornball and promotional way was the short 3-D film with occasionally moving seats, squirting water, the whole shebang. I laughed my way through. I love, love, loved the exhibit in the Pop Culture Gallery. Up through May 2011, it features works by a dozen artists that are part of the collection of Jean-Louis Foucqueteau of Switzerland, who has been collecting Coca-Cola memorabilia for more than 30 years and owns hundreds of rare and unusual artifacts. Very cool stuff. After we passed the tiny yet operational bottling plant, we took the stairs to Mecca — the geographically organized tasting room. 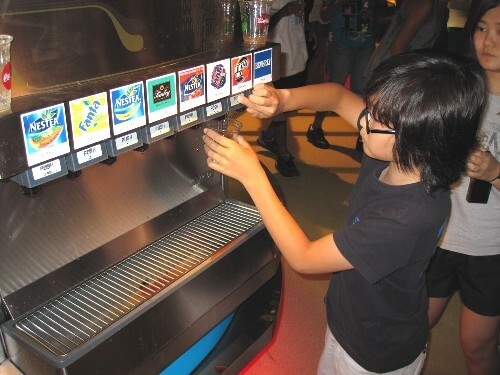 Here at the United Nations of soda drinking, visitors can sample more than 60 soda products that Coke owns worldwide. This went well beyond the obvious Coke and Diet Coke, though those are there, too. Try Lemon-Lime from Korea, Bitter Appertif from Italy, Ginger Ale from Mozambique. We sampled them all. After all this fun — and a free bottle of Coca-Cola bottled on the premises to boot — we didn’t even mind being funneled through the gift shop. I’m not naive enough to think that Coke is all sweetness and light, because I don’t believe the company is, but they do know how to put on a darn good show. 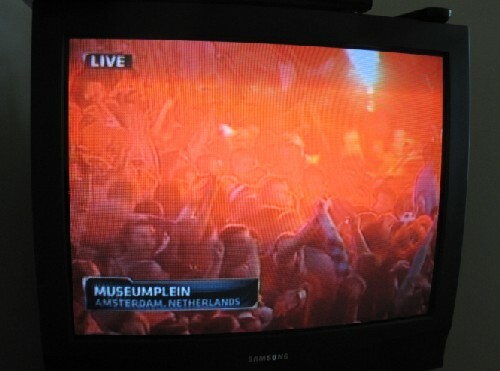 Hup Oranje hup! 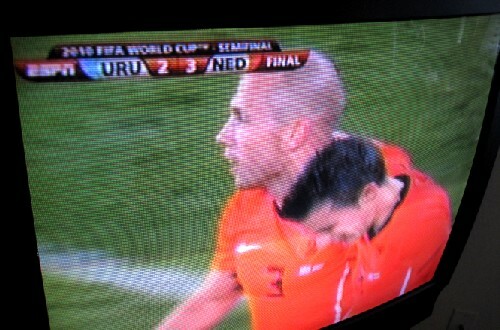 A Dutch victory! 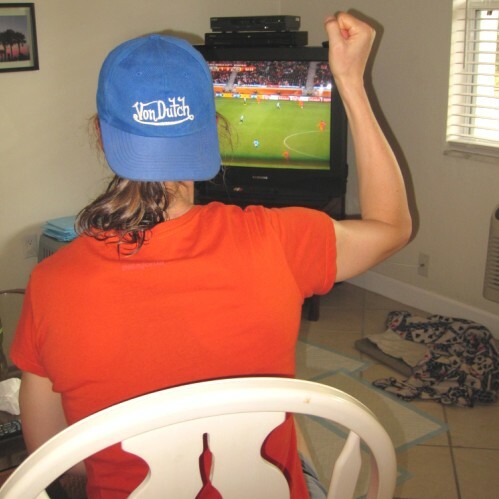 Wessel cheers on his national team from Indian Rocks Beach, Fla.
We haven’t had great weather in rainy Florida this week, but we did have one big treat: the Netherlands made the World Cup final match for the first time since 1978! Woo-hoo. Today’s score: 3 to 2, beating Uruguay. We don’t even have cable at home, but here in Florida we have an array of channels for our renters, including, of course, ESPN. Lucky us. We’ll be back in North Carolina for the championship game on Sunday. Germany or Spain, here we come! This was first published Dec. 13, 2009, in my Boston Globe column “Where they Went.” It’s one of my favorites! 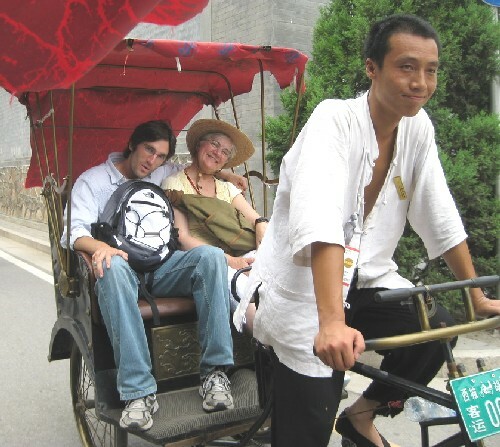 WHO: Alice Foote, 65, of Wilmette, Ill., with sons Mike Foote, 30, of Montpelier, Vt., and Jesse Foote, 30, and his wife, Beth Huston, 29, of Jamaica Plain, Mass. WHEN: Two weeks in July. FAMILY AFFAIRS: The Footes have seen other heavenly events. “As a family we saw the total solar eclipse in Mexico in 1991, and we were on a ship in the Pacific to see Halley’s Comet in 1986.’’ The Footes, from the Chicago area, frequented the Adler Planetarium there. 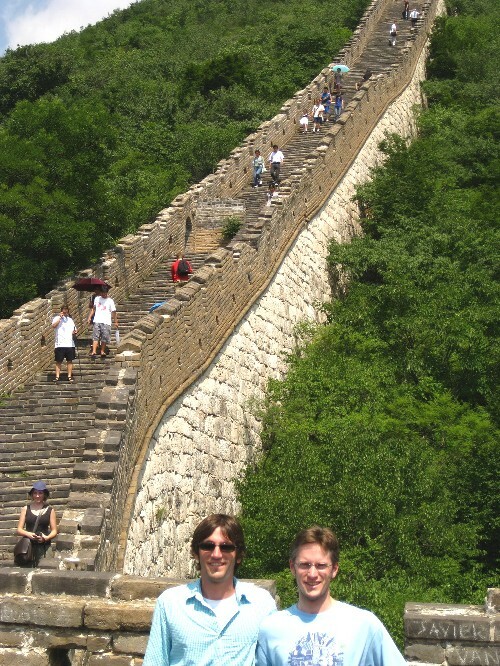 The eclipse tour was organized by the Adler and led by China Advocates. DAY AND NIGHT: ’’When the moon is over the sun, you can see it with the naked eye, and we saw a solar flare. All the night animals start making noises, and the stars come out.’’ The total eclipse was exceptionally long, at more than five minutes.